-Has great size for a shooting guard at 6-7. -Outstanding rebounder at every level he's played at. 8.0 per-40 in Crete. -Excellent defender. Guarded 3-4 positions on a consistent basis in Crete. Often used to slow down point guards thanks to outstanding lateral quickness. Shut down a number of very good offensive players over the course of the week. -Has a little bit of a slingshot motion to his jumper. Hesitates to shoot when left open at times. Splayed some ugly jumpers left and right at times, including a few airballs. -Decision making is not quite there yet. Doesn't always know his limitations. Shot-selection can be questionable. 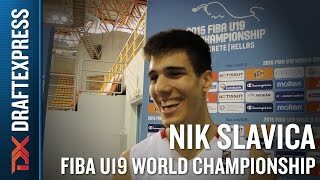 Outlook: One of the breakout performers of the U19 World Championship. Saved his best game for last, scoring 23 points with 5 rebounds, 6 assists and 3 steals against USA in the Finals. Was huge against Turkey in the semi-finals as well. Has the makings of a high level prospect with his tremendous size, frame, athleticism, playmaking ability, defensive potential and decent shooting stroke. If he can find a consistent outside jumper he is a very likely NBA player.